Teddy Lane was petty crook who had earned his living as a gigolo and a blackmailer. Now he had added drug dealer to his resume. Teddy had big ideas for criminal schemes but most of the time they did not work out as he planned. This time he had a great idea for a blackmail scheme. He invited the four people whom he wished to blackmail to a party at his grubby apartment. He had brought them together to announce that he had material on each one of them which he would use to blackmail them unless they paid him 500 pounds each. Teddy's big mistake was to bring them together. When the four left the apartment and met again, they decided that it was essential to kill Teddy Lane, and they devised a scheme to do this. Teddy recognized his mistake and his life became unbearable as he suspected everybody he saw of planning to murder him, and he was terrified to leave his apartment. Teddy needed money to get away from the city so he went to drug dealer for whom he worked and told him of a new scheme he had to get more drugs to distribute. This was a lie, and Teddy realized that the drug dealer would recognize this and try to kill him too. Life became even more complicated and dangerous. Teddy leaves the city only to suspect that he was being followed, and then returned to his apartment where finally he met his end. One of the original four at Teddy's party was arrested for the murder, and two others of the four hired lawyer Arthur Crook to come to her defense. Crook believed in her innocence as he believed in the innocence of all his clients and sought the real murderer and almost loset his life in the process. I enjoyed this book because it was well written, and Gilbert is wonderful in describing Teddy's fear as he tries to flee from the people who want to murder him. The reader truly feels what it is like to suspect a murderer to lurking every place he goes. This book was written by Anthony Gilbert and published in 1953. 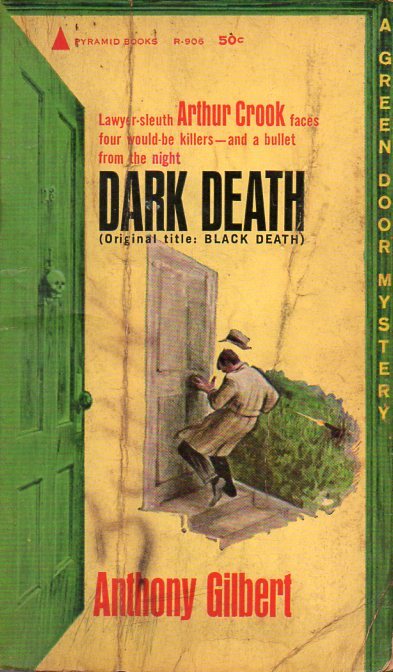 The original title of this book was Black Death. Anthony Gilbert was the pseudonym of Lucy Beatrice Malleson. She wrote 69 mystery novels and 51 of them featured Arthur Crook who was a rather crooked lawyer who resorted to possibly illegal means to clear his client. 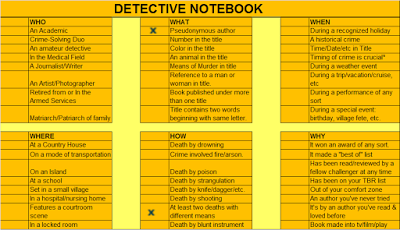 I have read this book for the Just the Fact, Ma'am challenge in the category of my Detective Notebook of How- At least two deaths of different means. The murderer in this book poisons one person and shoots another.